I've been looking forward to creating fun, coral looks - it feels like the perfect color for Spring and Summer! Plus, this month's theme for the Canadian Beauty Bloggers is featuring the 2019 Color of the Year! I got this mini Tom Ford lipstick as a point perk last year from Sephora, and it's perfect for the Colour of the Year! Tom Ford Lip Color in True Coral ~ $70.00 CAN for full size (deluxe sample shown here). A luxurious lipstick in an array of essential shades for the many dimensions of the TOM FORD woman. 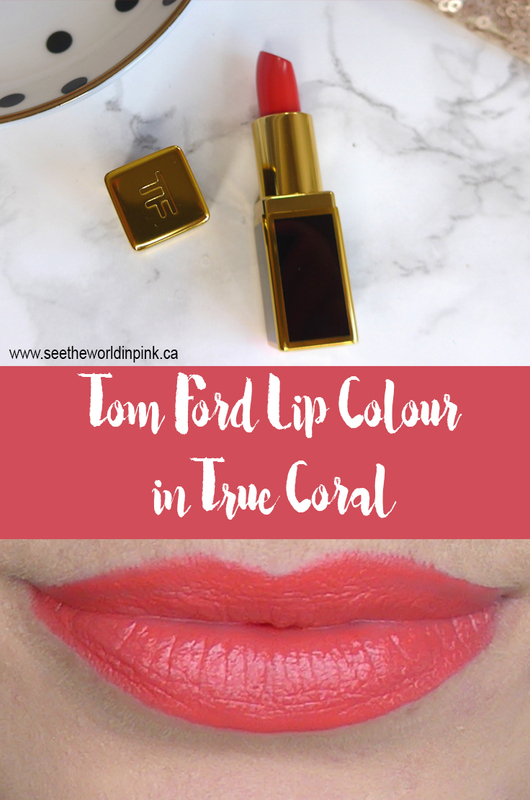 Tom Ford is pretty much the definition of a luxury brand to me - these lipsticks are made with exotic ingredients such as including soja seed extract, brazilian murumuru butter, and chamomilla flower oil to create a super smooth and creamy application! Here is the swatch of True Coral - you can tell it's got a nice sheen and finish to it as well! This is a super smooth and soft lipstick - I was very impressed with the formula! You can tell why people love this lipstick! And, here is a look at Tom Ford Lip Color in True Coral on the lips. It's such a beautiful shade and formula; but, you can see that it bleeds a tiny bit around the edge of my lips. This formula because it is so creamy, would really benefit from a lip liner to help it from spreading! This is such a fun bright, coral shade - it's actually something I would rarely tend to wear; but, it's so beautiful and bold! The formula was very comfortable - I do actually wish I got this formula in a more neutral shade, so I could wear it more often! This is long wearing if you aren't doing much while you are wearing it! This is certainly a formula that will move if you eat and drink with it - it would probably be easier to wear in these situations if it was more neutral! If you are interested in what's on my eyes, it's the lovely ColourPop Jelly Much Shadow in Wide Awake. Long story short - absolutely lovely formula and it's just a beautiful shade; but, is more of a look and don't do anything in it bold shade! Thank you!!! I do love this shade so much!